Messes are a part of life. Whether it is the dinner table after a party, your child's room after a playdate, or an area of your home that has gone too long without a good purge, messes are everywhere. This past week I encountered three different messes in three different contexts. I cleaned out my kitchen in preparation for the Ina In A Year project. I cleaned out my closet in preparation for (hopefully) cooler temperatures. 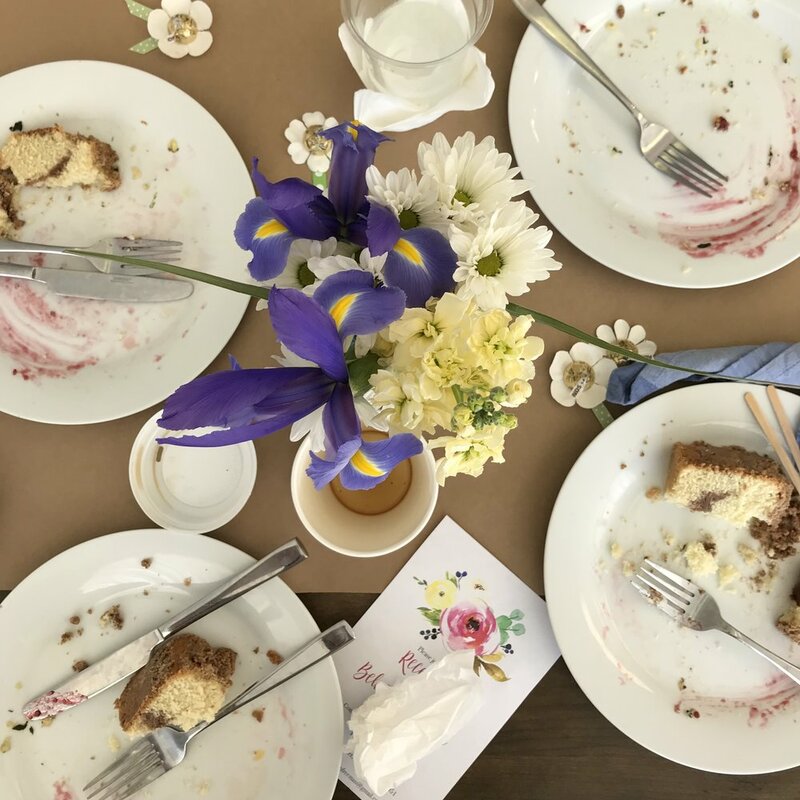 And, at Hurley House, we had a large brunch for 24 women which went swimmingly, but left a bit of a mess to clean up after the party was over. Dealing with a large mess is so much less daunting when I have a strategy, and in each situation, my approach was the same. The game plan is my guide, and it keeps me from feeling overwhelmed in the process. So how do you approach a mess? I approach a mess with three simple steps. Remove the trash. Put things back where they belong. Clean what's left. Trash removal is my go-to first step. Trash is obvious, easy to find, and you don't even have to question what to do with it. Trash doesn't require me to think through options. It's trash. I throw it away. Paper napkins, place cards, wine corks, empty juice boxes, birthday candles, disposable forks...they all go into the trash. Once the trash is cleared, I'm ready to deal with what's left. Next, I take any items that have a permanent place and are in good condition, and I put them directly back in that place. For example, votive holders go into the closet. Leftover wine goes in the fridge. Candlesticks go in the hall. Platters go on the buffet. Ice buckets go in the bar. Flower arrangements stay on the table to enjoy for the next couple of days. The last step is to look at what remains and clean it. Maybe it is a stack of dinner plates that need to be washed. Maybe it is a pile of napkins that need to be put in the laundry. Maybe it is a platter of cookies that need to be put in an airtight container, and then the platter put back on the shelf. This category includes all the items that need a bit of attention. With everything else out of the way, it's clear what action to take. By the time I get to this point, the work is minimal and my efforts are efficient. My experience has shown me that once you remove the trash, and once you put items with permanent homes back where they belong, the things that remain are clearly headed to the sink to be washed or the laundry to be cleaned. This held true when I cleaned out my closet. First I removed the items that weren't going to stay (trash or things I no longer wear). Then I put back on hangers or back into drawers the items that I am keeping (well-loved wardrobe staples that fit correctly and are still in style). And finally, I put into the laundry any items that need to be washed. The same works for my children's room after a play date. Throw away the trash (old balloons, snack wrappers, coloring pages), put away the items that belong and have a place (blocks in the bin, coats on the rack, books on the shelf), and then put into the laundry or dishwasher things that need to be cleaned (dirty clothes, lunch thermos, sippy cups). I have yet to meet a mess that wasn't easily approached with this three-step approach!